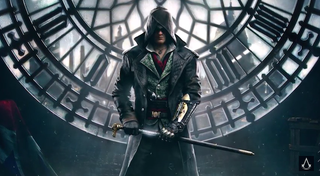 It’s official: the next Assassin’s Creed is called Syndicate, and it’ll be out for PS4 and Xbox One on October 23, with a PC release coming later in the fall. If you read Kotaku, you already know a lot about Syndicate—it’s set in Victorian London, it will have both male and female protagonists, and it puts a lot of emphasis on carriages and grappling hooks—but now it’s all Official. Syndicate takes place in London during 1868, and will star the brother/sister duo of Jacob and Evie Frye, who run their own criminal gang. As we reported yesterday, there’s no multiplayer. The game won’t just have a playable female assassin, but, in what is a bit of a turn for the franchise, will have numerous female enemies, down to the grunt level. As is series’ tradition, the game will feature historical figures. So far, the developers have confirmed that Charles Darwin and Charles Dickens will appear in the game. You can hijack, ride, and fight on top of carriages, as we covered back in December when we first posted about the game (then called Victory). Assassin’s Creed games have never been as great at stealth gameplay as we’d hope. The stealth systems have been tweaked again for this one, though it’s unclear how it’ll all work. The GameSpot preview notes that “the hard [cover] snap is gone, and you won’t be spending your time painstakingly trying to meld into groups of people” and will instead be crawling, crouching, and manipulating the environment to sneak around. Syndicate is bringing back the whistle, a tool of distraction that worked well in prior AC games but was inexplicably omitted from Unity. Syndicate features some sort of recruitment system that allows the player to amass gang members and get into big street brawls, a possible variation on older AC games’ systems for recruiting and summoning ally assassins—something that was missing in Unity. The development team is bringing back the day-night cycle, which had been missing from Unity. As always, for initial AC reveals, they’re barely talking about the game’s modern-day story but did say “we are following in the footsteps of Unity” with more to be revealed this summer. Note that Unity had far less of a modern-day story than prior AC games.